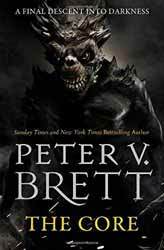 The Core: A Final Descent into Darkness is the concluding novel in the Demon Cycle, written by Peter V. Brett. This was a seriously massive book to read, but then it needed to be. In the previous novels Bret has introduced so many characters and a war which stretched across a continent that there were a lot of story threads to be resolved. The novel's story takes place across multiple locations as the demons ramp up their attacks on the human population and so the author has spent the greater part of the novel not with Arlen and Jardir, but with those that have been left behind to see to the defence of the free cities, Abban, Leesha and Inevera. The latter two have some very personal history, the former is pregnant with Jardir’s baby, which obviously does not go down well with Inevera, his wife. She already has her hands full as everyone believes that both Jardir and Arlen are dead, which has left a power vacuum in the land of italics. The one thing that I disliked about the previous novels was that when we spent time with the Jardir's people, the Krasians, not only did the writing swap liberally between people’s titles and names, but there was an unwarranted use of italics. Thankfully, this time, we spend little time in Krasia itself with the focus of the war being around Miln, Docktown and the Hollows. You start to get the idea why the book is so long. This does mean that if you were hoping to read a book which concentrated on Jardir and Arlen’s journey into the underworld you may well be disappointed as this part of the book is probably the weakest. The focus on Leesha and Inevera provides a richer vein of personal peril, tragedy and triumph. Brett is very good at writing for strong women, but at the expense of Arlen and Jardir. I can sort of see why this would happen. Arlen and Jardir’s focus is to get to the queen at the base of the core and kill her before she can unleash a new swarm. So, this part is fairly linear and while there are other member of the party, I particularly liked the captured demon consort as a character. There is only so much one can do with this scenario. Some of the story arcs are here just to finish up the series, so Abban’s story didn’t add that much to the overall plot and is only added for completion. Brett has certainly provided a satisfying conclusion to the Demon Cycle. I like the fact that not everyone has a happy ending and the fact that even at the end the characters do not walk off into a rosy finish, after all why should they, a lot of things have happened in their relationships, some which are hard to forgive.